Existing home sales declined for the first time in four months as all-cash investors continue to retreat, further opening up the market for first-time buyers. Returning first-time homebuyers to the existing home sales sector is important because prospective repeat buyers must sell their existing homes before buying newly built homes. 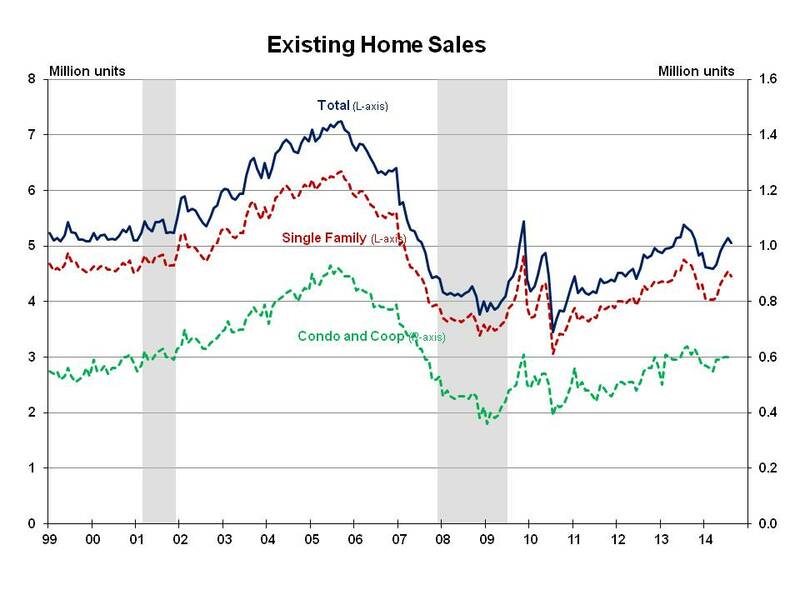 Existing home sales decreased 1.8% in August, and are 5.3% below the same period a year ago. The National Association of Realtors (NAR) reported August 2014 total existing home sales at a seasonally adjusted rate of 5.05 million units combined for single-family homes, townhomes, condominiums and co-ops, off from a downwardly revised 5.14 million units in July. The Northeast and Midwest increased 4.7% and 2.5% respectively from July, while the South and West decreased by 4.2% and 5.1%. All four regions were down from the same period a year ago, ranging from 3.8% in the South to a 9.8% decrease in the West. Seasonally adjusted condominium and co-op sales also decreased by 1.7% from July and 7.8% from the same period a year ago. The first-time buyer share remained unchanged at 29% in August after increasing the three previous months, far behind the historical average first-time buyer share of about 40%. Tight lending conditions continue to buffet first-time buyers despite reports of easing standards, and a full recovery awaits their return. However, as all-cash investors retreat, sales contracts from first-time buyers will face a more level playing field. Total housing inventory decreased 1.7% in August to 2.31 million existing homes. At the current sales rate, the August 2014 inventory represents a 5.5-month supply, unchanged from the previous three months but 4.5% higher than the same period a year ago. NAR also reported that the August median time on market for all homes was 53 days, up from 48 days in July and 44 days in June, and up from 43 days during the same month a year ago. NAR reported that 40% of homes sold in August were on the market less than a month, unchanged from July and down from 42% in June. The distressed sales share fell below 10% for a second month in a row since NAR began tracking the series in October 2008. The share of distressed sales decreased to 8% in August from 9% in July and 11% in June, and 12% during the same month a year ago. Distressed sales are defined as foreclosures and short sales sold at deep discounts. All cash sales were 23% of August transactions, down from 29% in July and 32% the previous three months. Individual investors purchased a 12% share in August, down from a 16% share the previous three months and 17% during the same period a year ago. Some 64% of August investors paid cash, down from 69% the previous two months. The median sales price decreased in August to $219,800 from a downwardly revised $221,600 in July, although the sales price was up 4.8% from the same period a year ago, the 30th consecutive month of year-over-year gains. The median condominium/co-op price decreased to $220,600 after five consecutive monthly increases, and is up 2.1% from the same period a year ago. The Pending Home Sales Index increased 3.3% in July and increased in three of the previous four months. The positive momentum from the very slow start at the beginning of the year was offset in August as the expected retreat of investors combined with a decrease in distressed sales to deliver fewer sales but a healthier market for home buyers.